This chic ground-floor integrated pool and spa gets an abundance of natural light from the surrounding windows and looks out onto expansive grounds. 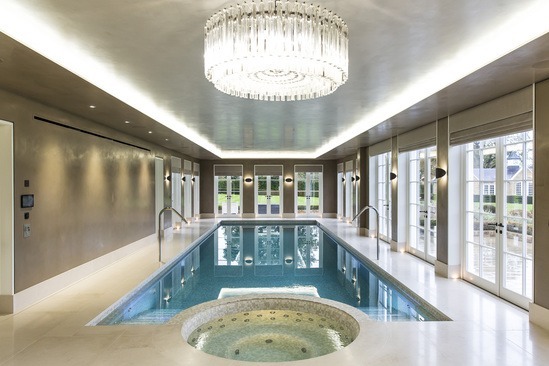 The lighting is a key feature in this elegant pool hall, from the daylight to the 3 x 3w Wibre underwater lighting in the pool, to the grand ceiling illumination. 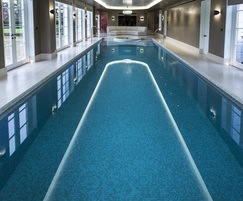 A classic design, the pool measures 13.5 x 4.20m. The shallow end is 1.5m in depth, falling to 2m at the deep-end. The pool features an Astral neck-jet water cannon on each side, creating waterfalls. 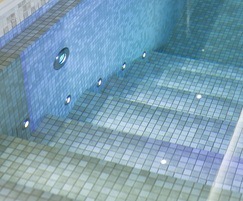 The 2.1m diameter spa accommodates five bathers and has an extended seatback and footwell. At seating level, the water depth is approximately 0.5m. 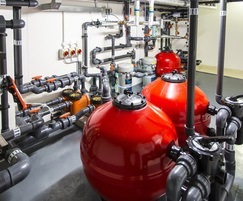 Multiple jets deliver stimulating and soothing massages via standard air / water mix jets. Completing the pool is an Ocea automatic slatted pool cover installed in a recess floor. The pool cover mechanism is hidden under a structural false floor panel, which is completely blended into the pool finish. The pool cover helps to minimise running and maintenance costs as well as providing added safety by closing-off the pool when it is not in use. 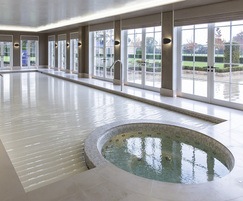 The same bespoke tiling design runs throughout the spa and pool. Large format porcelain tiles in a travertine design were cut to mosaic size and affixed to a backing sheet. To give the tiling extra pizzazz, different shades of beige and brown tiles were combined.